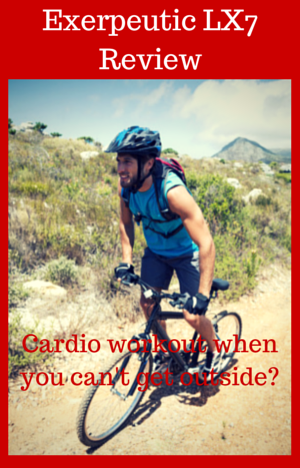 The Exerpeutic LX7 Training Cycle has many great features for as tough a cardio workout in your own home as you want. However, it doesn’t come without a few concerns that you need to be aware of. In our review we look at each of these in turn to see what impact they might have on your workout. It is a heavy solid bike that comes with a good size flywheel, heart rate sensor, console and adjustable seat to fit different users properly. It comes with everything that is needed to give a quality intense workout and even a more sedate one if you want. It comes with features that are not common for a spin bike at this affordable price. It has many things that commendable but this is mixed in with some areas that could do with some improvement. It is a good looking bike with the blue stripe along the crank guard and the blue swirls on the flywheel. This is a well made bike constructed of steel with a heavy flywheel to give a stable workout. You may notice some vibration when pushing hard standing up and a very slight wobble but it doesn’t make you feel unsafe and shouldn’t affect the quality of your workout. It is similar to what you may notice from the spin bikes at a gym when cycling hard out of the saddle. The feet can be used to stabilize the bike if you have an uneven floor. They all can be adjusted individually to level it out so the bike won’t rock from side to side. Having said it is well made there are a few instances where there are issues with it breaking down within a few weeks of purchase. This can happen with any piece of equipment. But the issue is that when it happens the company does not respond as quickly as they should do in sorting these issues out. It is in the small minority of cases, and it understandable that this can happen from time to time, but the company needs to improve their level of response to the issues when things don’t go as planned. The Exerpeutic LX7 Training Cycle seat can be adjusted vertically and horizontally, whereas the handlebars can only be adjusted vertically. The seat adjustments are quick to do. This is done by undoing the knobs and pulling them so you can then slide the adjustment poles to the height you want and align the hole with the knob and then tighten up. The handlebars work in a similar way but you use 2 knobs for some reason. You need to loosen both to move the handlebar to the height you want and then tighten them back up to hold them in place. It is quick to do this so the bike can be swapped over from one user to the next in a minute or two (or less) making it able to be used by more than one person in a home. It is great to see a company actually tell you the heights a bike it is recommended for, they normally like to keep you guessing for some reason. Anyway, this bike is recommended for those between 5 ft 2 ins and 6 ft 2 ins. Some people at 6 ft 3 ins tall have found this bike fine for them but if you are that height you may find the bike a bit cramped and not fitted to you properly for the most efficient form. If you are shorter than the minimum height you can probably get it to suit heights another 2 inches lower by putting the seat all the way down and ignoring the adjustment holes. It is stable but it is not recommended. Resistance is applied to the flywheel to give a tougher workout by turning the tension knob at the top of the frame. It is friction resistance and works in similar way to most spin bikes. There is a felt pad that sits on top of the flywheel and the tighter you turn the knob the more resistance is applied to the flywheel. This gives a constant amount of resistance to the flywheel so there is no “stop start” feeling as you ride the bike. The pad is going to wear out in about 6 to 12 months (as is standard for these bikes) and you can get replacements through the company’s website. If you want to stop the flywheel quickly you do this by pushing down hard on the tension knob. You will want to use this if you want get off the bike fast. The bike has a fixed gear so the pedals continue turning as long as the flywheel is turning and you shouldn’t take you feet out of the pedals while they are turning or use them stop them turning instantly. There are no set levels on the resistance. It is continuous and incremental. This is a bit annoying as it can be difficult to know what resistance level you were using on your last workout especially if it has been changed in the mean time. But, this is normal for spin bikes with only those with magnetic resistance having levels (see Sole SB700 and Keiser M3 plus if interested in this but these bikes are more expensive). The resistance comes on gradually as you turn the knob so you don’t go from easy to too hard in a quarter turn, making it simple to determine how much to turn the tension knob to get the resistance you want. There isn’t too much noise from the resistance on the flywheel other than a whooshing sound you’d expect. You can hear it but it is not an issue if it has been properly lubricated otherwise it can make a loud squeaking noise. You can do this lubrication with silicon based lubricant yourself and only takes a few minutes as required. This bike uses a chain drive for turning the flywheel just like you find on an outdoor bike. It gives you the same feel as riding one of those bikes. It also has the same noise and maintenance requirements as well. You will need to keep the chain lubricated and tightened to keep it running in good order. It doesn’t take that long but is more than required on a belt-drive where none is required on an ongoing basis. The noise from the chain drive is not that noisy but it is louder than that from other spin bikes I’ve reviewed. It probably won’t be heard by someone sitting in the next room with the door shut but at times it does bang against the guard (which is there to protect your ankles and clothes from the chain) making a louder noise. This seems to be something to do with the design of the bike as many customers do mention this. The pedals come with toe cups that you slip you shoe into and tighten up the straps to keep your foot in place when pedaling. You can use the other side of the pedal if you don’t want to use the cups. If you want to use cleats or spinning shoes you need to replace the pedals. Which you can do with standard size bike pedals. The pedals and the crankshaft are strong enough for you to stand up and do hill climbs while pushing hard against the resistance without being concerned. The q-factor is not available for this bike and I have requested from the manufacturer but it is likely to be between 7 1/2 to 8 1/2 inches – as is normal for bikes in this price range. Noise. This is a bit noisier than most spin bikes but not by that much. There is more chain noise than you usually get from the bikes. If you are looking for a quieter bike with a chain drive it is worth considering the Sunny Health & Fitness Pro Indoor Cycle Bike but it does not have a console. Flywheel Weight. This weighs 40lbs and gives a good consistent feel to your cycling like you get when on an outdoor bike. The flywheel weight is important to ensure you get a natural feel to the cycling and you don’t get any stop-start motion which can be uncomfortable and cause injury. Handlebars. These are padded so you can lean on them when you are in sprint position without them being too hard on your arms. The padding helps for grip, preventing blisters and stop your hands from slipping when they get wet from sweat. You can place your hands in 3 different positions for when you are riding in the seat you can have them placed in the center or at shoulder width apart, and when standing you can have them shoulder width apart or holding on to the end of the bars to give you the leverage you need. Seat. In one word – uncomfortable. Although some people manage on it most find it too hard and narrow. This is not unusual for seats on spin bikes to have this effect. This is the same type of seat you find on regular bikes – which are also know for being hard on the sit bones. It also means you can swap the seat out for any other standard size bike seat. When using the bike Paradigm Health advise a minimum of 6 feet for safety reasons. The bike itself is 20 inches wide and 47 inches long. So it doesn’t take up that much space when not in use so if you have the room you could leave it in place but for most of us it is going to be have to be moved and stored and out the way not in use. It is a heavy bike- it weighs 90 lbs. To help with moving it there are 2 wheels at the front that you tip the bike up on to that take most of the weight. The wheels are a bit on the small size and you may have difficulty when moving it on carpet with a deeper pile. Other than that there won’t be a problem. Other surfaces such as tiles and wood (check it doesn’t scratch the surface or leave marks first) will be fine unless you want to move it up or down stairs then it is going to need two of you to lift it and move it. If you live in an apartment you may want to consider one of the bikes listed in best apartment spin bikes that are easier to move and quieter too. The bike is delivered mostly assembled and comes with the tools needed to assemble it. Time to assemble is about 1 to 2 hours. It is a straightforward process and the manual instructions and diagrams are easy to follow. The parts and hardware are labeled clearly. The frame, crankshaft and flywheel are put together when it is delivered. You add on the front and rear stabilizers, the pedals, seat posts, seat, handlebar post, handlebars, console and finish with connecting the wires. The shipping weight of the bike is 106 lbs and assembled weight is 90 lbs. For this reason it is advisable to have 2 people involved in the assembly to make lifting and holding it in place easier when putting it together. This sits at the front of the handlebars. It is a basic console with a small LCD screen that can be hard to see when you are working hard. It monitors RPM, calories burned, speed, distance, time elapsed and your heart rate when your hands are on the heart sensors. You can’t see all the numbers at once. You have the option to just see the one number for your workout or you can set it to scan through all the numbers every few seconds. You select the information you want to see by pressing the mode button. To reset the numbers you hold the mode number for 4 seconds. It needs two AA batteries to power it and to start it up you can either start pedaling or pressing the mode button. After 4 minutes of no pedaling the computer turns off. There are issues with the accuracy of the numbers. The heart rate sensor is dependent on you gripping the handlebars to get your pulse. But speed, distance and calories are estimates only and can be very far out, even overstating them by 6 times or more. This is a known fault and the consoles will be replaced by the company. Normally they are not that far out and it is good for giving you a comparative between workouts. The calories estimate is based on speed only and not resistance when it calculates the number. You can’t upload your numbers to the internet and it doesn’t store previous results so you need to record the details somewhere if you want to track progress. You do need to keep the console away from too much sweat as it will stop working if it gets too wet. This does happen from time to time and you would have thought the company would have made it water resistant. You get a water bottle holder that is placed at the bottom of the frame. It only takes a small water bottle unfortunately but it is easy to get to. The only problem with the position is you may find it gets wet from your sweat dripping on it as it is in a sweat zone. Also, you get heart rate sensors The heart rate sensors are at the end of the handlebars. To get a good reading it is advised to use both hands to grip the two sensors. If you are using the heart rate monitor to keep in your training zone and want to monitor constantly you are stuck in the one position which may not be the best one for you as you are stretching to the end of the handlebars, in particular this may be a problem when you are sitting down. Otherwise you can take it from time to time. I’ve read through over a 100 customer reviews online. There is no doubt this is a good bike at a good price but there seems to be an issue with quality control and customer service. Paradigm Health do a good job most of the time but they let themselves down and their customers with not checking the bikes properly before they are sent out and then not responding to customers quickly enough when there is an issue. Having said that, this doesn’t happen all the time but it does happen on occasion and it is reflected in the ratings. Other concerns noted in reviews are the console accuracy and that it vibrates at top speeds and resistance but is no more than you may experience on a bike at a gym. On the positive side the majority say that this is a good bike, they find it stable and sturdy and they can get a good cardio workout from it. The price on this bike can vary widely depending on whether it is in stock. When in stock the price can be between $200 – $250 which is about the right price for this bike. It has some good features but it also has some concerns over noise and durability which mean you shouldn’t pay over the odds for it. This could be a really good bike if Paradigm Health got its customer service together. It has a good affordable price, a heavy flywheel, good resistance adjustment and the bike is solid and steady so you don’t feel like it is going tip over – you can just get on with your workout. But on occasion the bike is delivered up to spec. case unfortunately and they don’t respond quickly enough when there is a problem.